Photo courtesy of Fiberygoodness.com Other beautiful yarny photos available on the site! 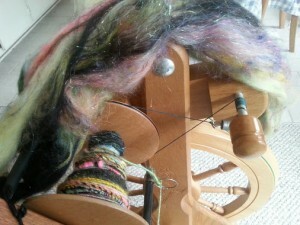 For the last several months I have been enjoying “Fibery Goodness” with Arlene (Spin Artiste) and Suzy (Woolwench) on fiberygoodness.com. There are wonderful things on their site, including courses like Journey to the Golden Fleece Creativity in Fiber Certificate, a Fibery Art Gallery of student creations, and other ‘pretties’. On the blog today they posted Stories!, including a Fairy Tale by Randi Winters. You should flip over and read it – it is a beautiful tale, with gorgeous yarn and spinning photos. Besides, if you are into yarn, this is a site you must not miss!